What does Guy Hollingworth, a full-time British barrister who may very well be the most sophisticated magician in the world, have in common with children’s magic? How can this Magic Castle Magician of the Year, about whom Derren Brown says, "You not only admire him, you want desperately to be him," be a creator of tricks for kids? He combines his amazing knowledge of card legerdemain with a theatrical delivery gained from performing his one-man show, Expert at the Card Table (which played to sell-out houses in Edinburgh, Los Angeles, Las Vegas and London). 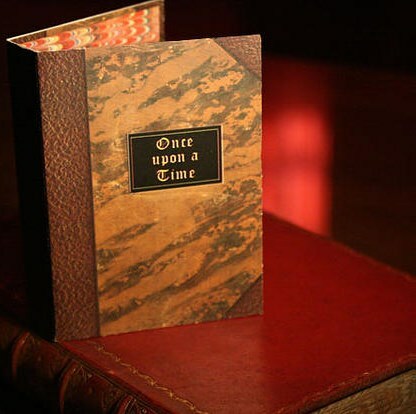 The result is an oh-so-charming presentation of three fairy tales presented with a unique deck of cards which make up the pages in a little leather bound book called Once Upon A Time. I reviewed Hollingworth’s Once Upon A Time in Genii Magazine’s trick review column when was first released. This is a charmer. Think Sam The Bellhop meets Fairy Tales. But the deck of cards is an assortment of storybook illustrations of Goldilocks, Cinderella, a glass slipper, a beanstalk, a pumpkin carriage, a Giant and bowls of porridge. The plot is simple enough: Even though the pages get all mixed up, because the book is magical, the tales tell themselves as the pictures appear, vanish and transform in just the right order. Three traditional fairy tales may be told, the most difficult move is a Double Lift, and the reset is instant so you are always ready to tell any one of the stories again. What do you have to learn to perform this? The scripts are the fairy tales themselves. You'll need to associate the various beginning level card moves with each moment of the script. Because the script will bring you back to your own childhood, you will find that the learning process is fun and quite satisfying. Click on the video above and see co-founder, Andi Gladwin, at a point in his life when he and his wife Sarah were expecting their first child. Once Upon A Time has been long unavailable in the U.S. However, Mr. Hollingworth has been kind enough to provide a limited supply for our customers. So if you think that you will ever want to tell a tale magically to a young child, we recommend purchasing before your internet-connected device turns into a pumpkin!